The Michigan House Natural Resources Committee held a hearing on October 4, 2017, regarding HR 154. 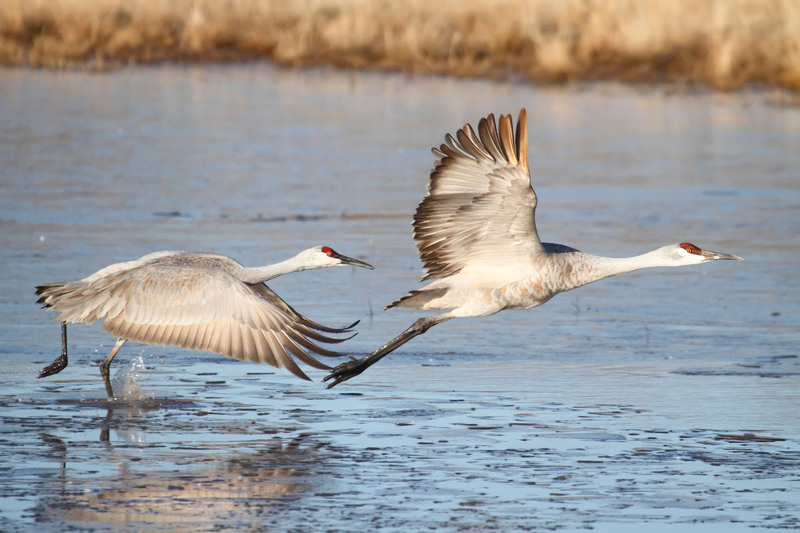 This resolution, sponsored by State Representative James Lower, seeks to encourage the Natural Resources Commission to add Sandhill cranes to the game species list and seek U.S. Fish and Wildlife Service approval to establish annual recreational Sandhill crane hunting seasons in Michigan. On October 11, 2017, the committee voted 5-4 in favor of this resolution. On October 18, 2017, by way of a voice vote, the Michigan House of Representatives approved House Resolution 0154. The issue will most likely move to the Michigan Natural Resources Commission for further consideration. Please contact the members of this commission and urge them to vote NO! Since its inception in 1904, the Michigan Audubon community has consistently supported and fought for the protection of native bird species. 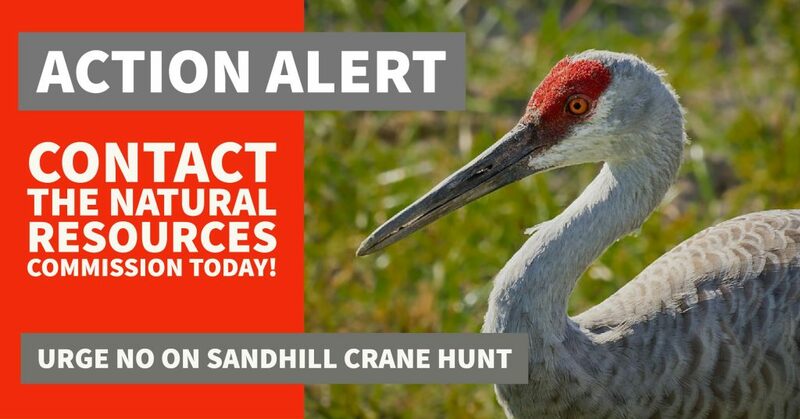 In response to a resolution, HR 154, that has been introduced in the Michigan House of Representatives that urges the state’s Natural Resources Commission (NRC) to authorize an open season on sandhill cranes, Michigan Audubon opposes the proposed Sandhill Crane hunt in the state of Michigan. A hundred years ago, the Sandhill Crane population in Michigan hit an all-time low – they were hunted nearly to extinction and suffered greatly from loss of suitable wetland habitat throughout the state. While the bird’s eastern population has recovered, and they are now abundant throughout the Mississippi flyway, we should celebrate this conservation success story rather than risk repeating past mistakes. While we recognize that Sandhill Cranes inflict minor crop damage, an open hunting season is not a viable solution. Michigan has already established a successful management tool for agricultural stakeholders experiencing issues with this particular bird. Cranes evoke a strong sense of appreciation and connection for many people in Michigan and around the world. Cranes and the habitats they use are valued and supported by wildlife enthusiasts, farmers, families, and landowners. For over 20 years, Michigan Audubon has held an annual celebration of Sandhill Crane migration in October, called CraneFest. The sole purpose of this event is to offer the public a free, family-friendly opportunity to witness these birds fly in at dusk as they migrate through southwest Michigan. Appreciating, understanding, and protecting these birds and ensuring their welfare into the future is work significant to Michigan Audubon’s history and mission. We believe Sandhill Cranes should continue to be protected under the federal Migratory Bird Treaty Act. What can you do to join us and support our work to ensure the Sandhill Crane population remains protected in Michigan? Read our position statement on the proposed hunt. 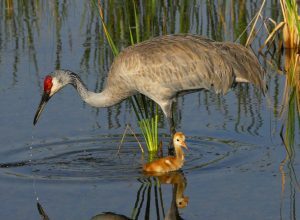 Contact members of the Michigan Natural Resources Commission and urge NO on adding the Sandhill Crane as a game species. Write or call your state representative and make your voice heard. Write or call your state senator and make your voice heard. Share the rationale behind protecting these birds with others in your community, on social media, etc. Become a member of Michigan Audubon and stay informed of issues facing birds and wildlife in our state. Donate to support our work on behalf of these and other native birds and the habitats they rely on. We hope for another successful stop to the proposed hunting of this iconic species and will keep our community informed via our social media channels, website, eNews, and our member magazine, the Jack Pine Warbler. Thank you for caring about Michigan birds and for your contributions to conservation!